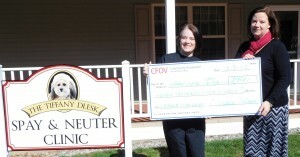 The Tiffany Dlesk Spay/Neuter Clinic is the first organization to receive support from the newly established Joseph & Marilyn Fraker Animal Care Fund. The $7,400 grant, which is also being matched by a private foundation, will provide support for the expansion of spay and neuter services offered by the clinic. The Fraker Fund, administered by the Community Foundation for the Ohio Valley, is the result of bequests of Joseph & Marilyn “Lyn” Fraker. The Frakers were New Martinsville residents and felt strongly about leaving a legacy that would support the protection and care of animals in the Wetzel, Marshall and Ohio County areas. Lyn was a founding member and past president of the Wetzel County Humane Society. She passed in 2010 and her husband, Joseph, passed in 2016. Susan Fraker, one of the couple’s four children, said her mother’s love for animals certainly extended to the children, though her father wasn’t initially keen on some of the lengths she went to help. This included stints of dognapping, which rescued dogs from abusive situations. As with many couples, the interest held by one soon became shared. “Growing up, we always had at least one dog at home, often more than one. It was well known in my Northgate neighborhood that when the dogcatcher made his rounds, any strays should be hurried into the Fraker garage for temporary protection. My father didn’t encourage this the way my mother did, but he tolerated it. After my mother began devoting most of her free time to the Wetzel County Humane Society, my father, somewhat reluctantly, took on the role of her answering service. And after his four children left home, my father became as devoted to the family dogs as my mother. People in New Martinsville joked about how they wanted to return in their next life as a Fraker dog,” Susan fondly shared. Through the Fraker Fund, the Tiffany Dlesk Spay/Neuter Clinic will be better equipped to create a healthy community for citizens and animals alike. The clinic will provide free spay/neuter services to qualifying applicants, including caregivers of feral cat colonies, and anticipates serving hundreds of pet owners in the Ohio Valley. These services ultimately lead to fewer unwanted animals in shelters and a decrease in euthanasia rates. Barbara Scanlon, a Marshall County Animal Rescue League board member, feels this grant is a dream come true and is certain the funds will increase the organization’s ability to do more. Scanlon had the occasion to work with Lyn Fraker many years ago through mutual animal rescue efforts and finds this particular gift to be incredibly meaningful. “She would be so pleased to see our progress now and to know in the last five years we’ve helped more than 10,000 animals through the clinic. We’ve come so far and this gift will help so much,” Scanlon said. Susan Fraker also notes the mission of the clinic aligns well with a special family memory that contributed to Lyn’s desire to be a tireless animal advocate. Susie Nelson, executive director of the Community Foundation for the Ohio Valley believes the first grant from any fund is significant and the Fraker Fund is no exception. “One of the most rewarding aspects of working at the Community Foundation is seeing how someone’s philanthropic gift makes an impact. This one was extra special. When I contacted Barbara to let her know the source of the grant money, she was overwhelmed with gratitude that it came from her friend Lyn. We look forward to many years of stewarding this gift to care for animals,” Nelson said. The Fraker Fund is part of the CFOV’s Community Impact Fund annual grant process and will accept applications from animal protection organizations in the Wetzel, Marshall and Ohio County areas. To learn more about funding opportunities please visit the Community Foundation for the Ohio Valley online at www.cfov.org.